This is the first in a series of articles in which Curious George staff writer Julia Carrigan interviews some of the behind-the-scenes people at George School–dining room staff, grounds crew workers, environmental services, and plant personnel; the people who keep us up and running day-by-day, year-by-year. These are the three words Colleen Crowley uses to describe her life. Working at George School for over seventeen years, Colleen has served as barn manager, emergency services officer, assistant self-defense teacher, and Culinart team member in the Dining Room. Though often overlooked, down through the years Colleen has made extraordinary contributions to the George School community. And George School is all the richer for her hard work, her friendliness, and her playful sense of humor. She felt the importance of knowing self-defense tactics lay in the fact that we are all vulnerable. “Anybody can get attacked, anybody. So it’s important for us to be able to get out, get away, be willing to put them down, and run like crazy.” She added that some of the more physical techniques can be especially useful for people who are not naturally loud or fast. “I don’t have a good scream; that part of my defense doesn’t work,” she said. Colleen Crowley at The Renaissance Faire. Although she claims that her life “hasn’t been as adventuresome as some other people’s,” and although she may never have climbed Mt. Everest, or starred in a Broadway musical, or worked as an FBI agent, Colleen has led her own uniquely individual life that is exciting in its own ways. 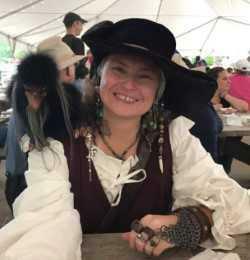 She dares to be an earth girl and dress like a pirate at the Renaissance Faire. She dares to tame horses and she dares to learn to defend herself. She even dares, when exam week comes around, to stop a hungry high-schooler from grabbing six chicken fingers instead of the allowed five. Although Colleen’s life may be summed up as “steady, quiet, and good”—that sounds pretty adventuresome to me. We’re on board the last flight to Cape Town. More news tomorrow. Photos too. We’re weary from the journey, but excited to be here. Here we are, packing all of our donations!! You never appreciate your washer and dryer at home until you’re stuck using a bathtub and a sink in your hotel room. Anyway, life in Vietnam has been amazing and has been an eye opener. Visiting the orphanage has made me grateful for the family that I have and love dearly. Being away from home is also a new experience that I have to deal with. The first day I was excited to “be on my own.” These past few days I have been feeling homesick, especially missing my little brothers. All in all this trip is an amazing opportunity that I’ve been given and I couldn’t be more grateful for it. Today we drove to Mai Chau, but first we stopped at the Women’s Union in Hoa Binh, the capital of this province. We spent an hour there listening to all the great work that the Women’s Union does for the many communities in the province. We made our donations (three suitcases worth and money $$$$) and then continued on our way to Mai Chau. Mai Chau is actually a commune, made up of a small town, and Ban Lac and Pom Coong, where we are located. The boys stay in one house on stilts while the girls stay in another. Each of our mattresses on the floor has a mosquito net around it and we have plenty of fans “cooling” us off. The hosts here sure know how to cook! We sat down to a scrumptious meal of chicken legs, green beans and garlic, rice, soup, homemade potato chips, fried spring rolls, meatballs in sauce, and little bananas. Such a yummy dinner—everything, virtually everything, is grown or raised in this small village or in the neighboring one. This family, like most, has its own fish pond, rice paddy, vegetables and banana trees. George School has been coming to this family for over a decade. This post was adapted from a speech written by Head of School Nancy Starmer and delivered during the Opening Assembly on September 1, 2014.